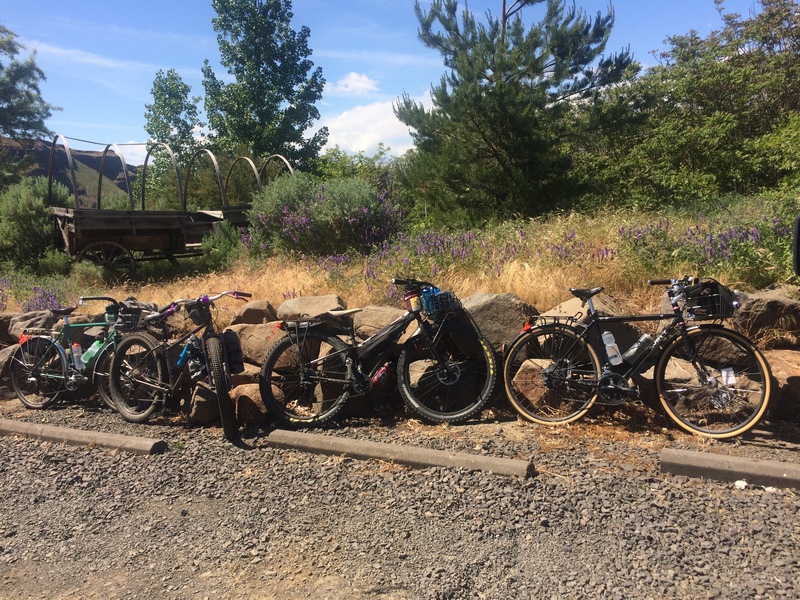 A couple weeks ago, on Bike Everywhere Day, I took a kid-free/Pixie-free train trip to Portland to carpool with friends to The Dalles for camping and bike riding. 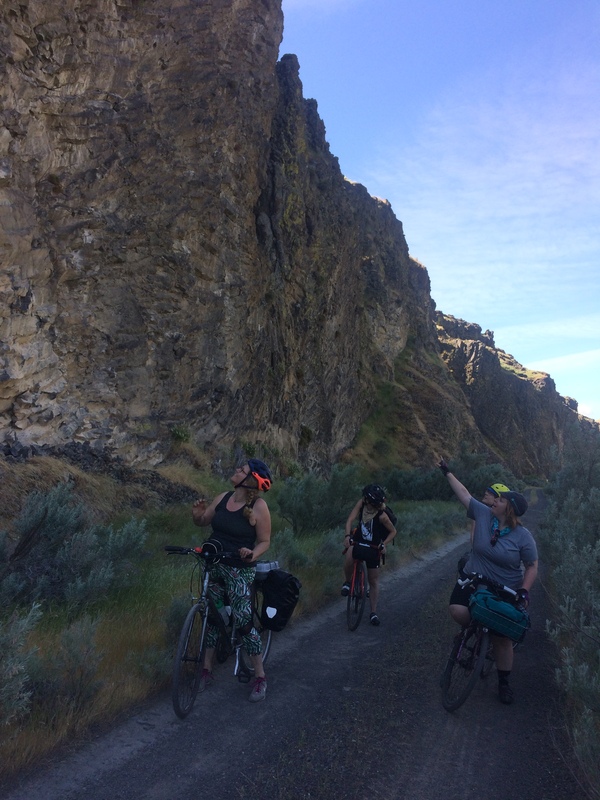 The impetus for the trip was Life on Two Wheels Marley’s plan to ride the Dalles Mountain 60 with a huge group of women over two days with camping in the middle. It sounded amazing! …except having just done the Dalles Mountain 60 with Pixie in March while carrying more weight than necessary on my bike (in addition to Pixie, that is) and considering I’m still quite a bit out of regular shape from riding a lot less than normal this winter/spring I knew I wasn’t up for it. 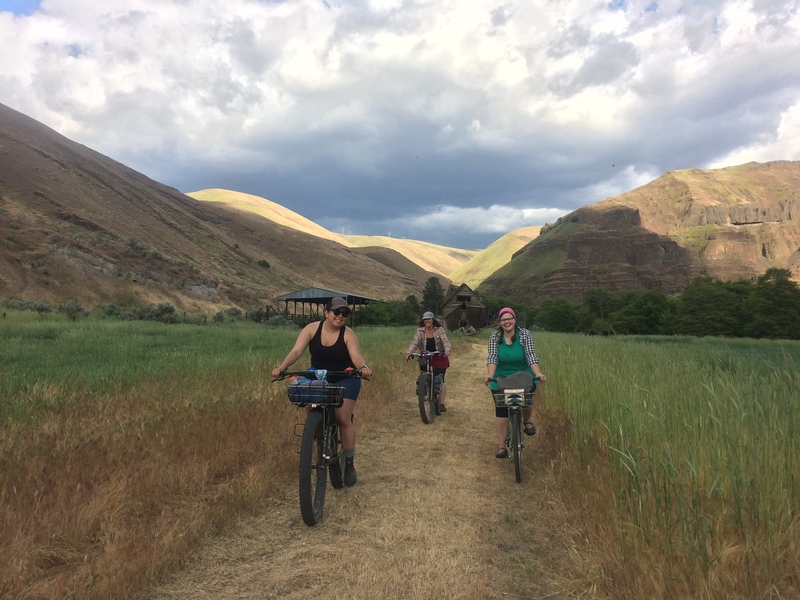 So instead a few friends (Coffee Kelley, Neighbor Kelly, and Chele) and I made plans for a gear-free (other than snacks) bike ride in the area with plans to visit Marley’s #galsatthedalles group Sunday morning. 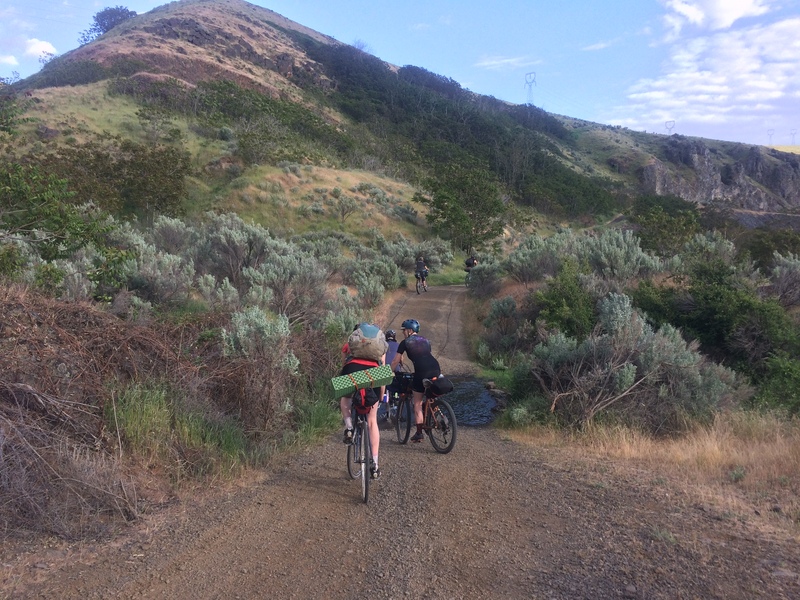 We would car camp at the Deschutes River State Recreation Area Saturday night after riding one of many scenic loops in The Dalles area. 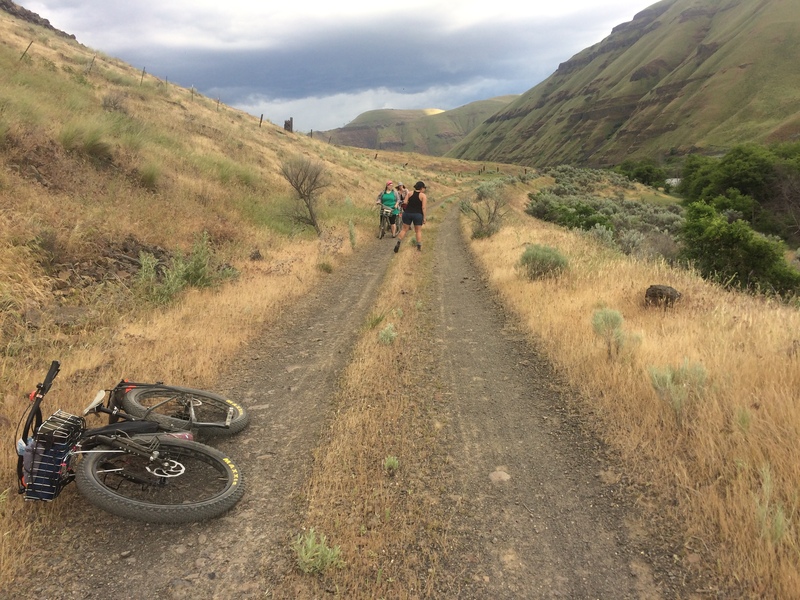 the original plan was to ride either Japanese Hollow or Hastings, but in the end we decided we’d simplify things and just ride out the Deschutes River Trail a bit, turn around, and come back. It was terrific! And since I tackle everything thinking about how it would be for kids: this would be a nice trail for kids, too! 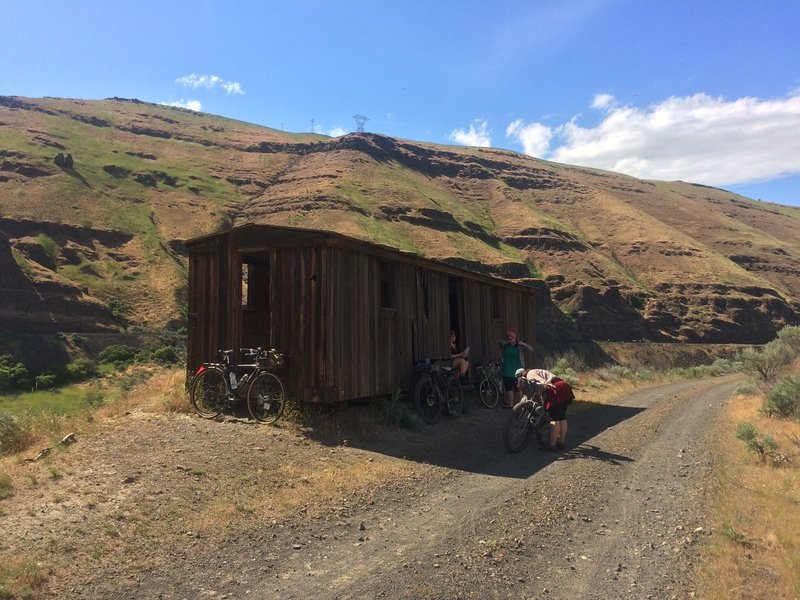 This Oregon Bikepacking post, Deschutes River Trail: An introduction to bikepacking, has terrific descriptions and photos of the trail. It’s nice to know we stopped before the goat heads (very pokey burrs that cause flat tires) got bad and that the rattlesnakes we saw are summertime-only denizens. We weren’t in a rush and thus got started fairly late in the day after driving over and setting up camp. It was close to 3pm and fairly warm by the time we hit the trailhead. The trail is mostly flat, save for one big dip where an old bridge was removed. On our way out we saw a mom and three kids coming up the hill–the oldest kid had biked up it and was resting/waiting at the top, the mom was pulling a trailer containing one little kid (!!! trailers are very hard to lug uphill! ), and the middle kid was walking his bike up from near the bottom. Taking kids three miles down the trail and turning back before the hill would even be a fun ride, but tackling the hill yields some great scenery on the other side…but, of course, having to descend and climb the hill again on the way back. I found descending the hill more difficult than climbing the hill, but I’m not much of a descender. Lots of the gravel is the good kind of small hard-packed gravel, but there is also quite a bit of rocky stuff to maneuver around. I rode my Surly Straggler with smooth Compass tires with 38mm of width and they were OK. Neighbor Kelly’s Rivendale Atlantis was the other “narrow” tired bike with 42mm wide Compass tires and Coffee Kelley and Chele rolled on 3-inch fat tires on rigid (no suspension) fat bikes–a Surly ECR and a Bantam adventure bike. We all thought it was pretty bumpy. Along the trail are several pit toilets (bring toilet paper if you’re visiting outside the high season) down near the river surrounded by open areas for dispersed camping for hikers, bikers, and rafters. 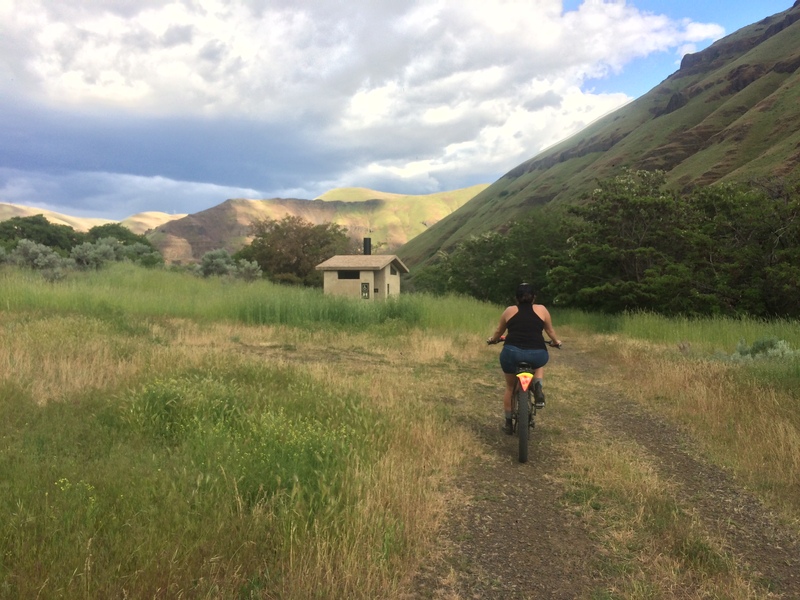 This is where the 18 #galsatthedalles camped, but we opted for the luxury of the regular, less-rustic camping at the Deschutes River State Recreation Area campground. While we didn’t go quite far enough (and I’m not sure how eager I would have been to hike up a steep side trail if we had!) 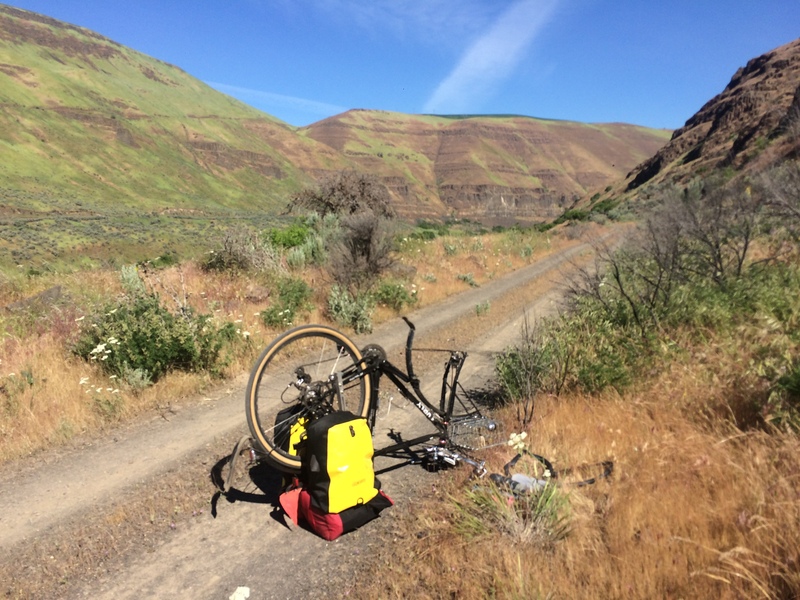 to see the petroglyphs mentioned in the Oregon Bikepacking post, we saw lots of cool stuff. Abandoned train car! The abandoned train car around mile six provides shade! And it’s fun to explore. It’s very close to a spot with cell phone reception, too. Puddle! At the bottom of the hill (3.5 miles in) there’s a puddle or two to ride through. Deep enough to splash one’s feet. 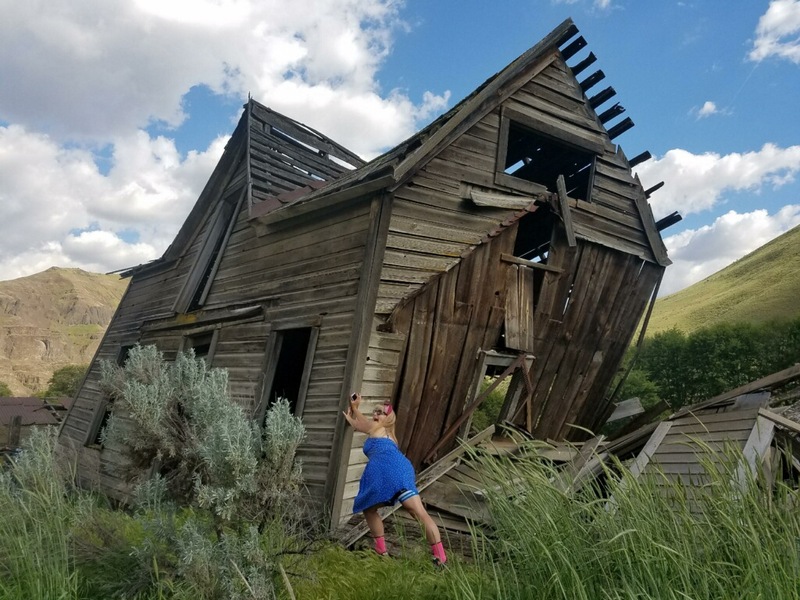 Related: there are also a couple cow catchers along miles 0-11 in case you’re touring with a Chiweenie (Pixie was running free for portions of the Dalles Mountain 60 and got tripped up by one). Lava tubes! I think these were a bit past the hill. Remnants of little lava tubes according to Coffee Kelley who knew the most about the region–though the least about rattlesnakes–of all of us. Old homestead! The old homestead 11 miles in was our turning-around point and a good shady rest spot. Coffee Kelley said last year when she was here the house was upright and she was able to walk up the stairs inside. I hope it doesn’t dilapidate more because it’s beautiful in its current state! Rattlesnakes! We saw a rattlesnake in the barn by the homestead!!!!!! It was my first rattlesnake; Coffee Kelley’s, too. Neighbor Kelly and Chele both grew up with snakes (not to be confused by “were raised by snakes”). It wasn’t feeling social and slowly slithered away as we took photos. This one never coiled up and rattled. While heading back we passed close to a snake on the side of the trail that did rattle! I pedaled past before I realized what was going on while my three friends stopped behind it to let it move away from the trail. Coffee Kelley took pictures. I took pictures of Coffee Kelley taking pictures from a much safer distance and decided I’d Google “rattlesnake bite treatment” once back to camp with a cell signal. I was relieved to read that the rattlesnakes are summer attractions. Between that and the heat we experienced, this trail is probably most fun in the spring. Dispersed campers! We saw a group of teens with a couple counselors bike camping at the farthest (mile 10?) pit toilet. I was so impressed! Especially when I rode out the following morning and saw them returning to civilization, just after they scaled the hill. Go kids! We encountered the #galsatthedalles group in small batches as we headed back to camp Saturday night and directed them to the camping area by the pit toilet around mile 8. Conveniently the group of teens had left markings in the gravel at the turn off (indicating “No, don’t stop here, continue along” for their own group). We may have been a little excited about our snake sightings and mentioned the possibility of rattlesnakes to each group, but I don’t think we caused any undue fear. 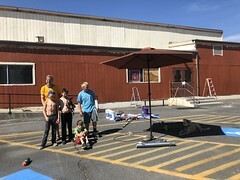 I rode back out the following morning to visit with the #galsatthedalles and found them breakfasting and breaking camp. It turns out they had a car at the trailhead for carrying their gear so I volunteered to carry stuff out on my empty bike since they still had a 30-mile day, including Old Moody Road. I scored two panniers and a shoulder bag. I also scored a pinch flat, boo. But that was the only flat for our small group all weekend. And that’s that! 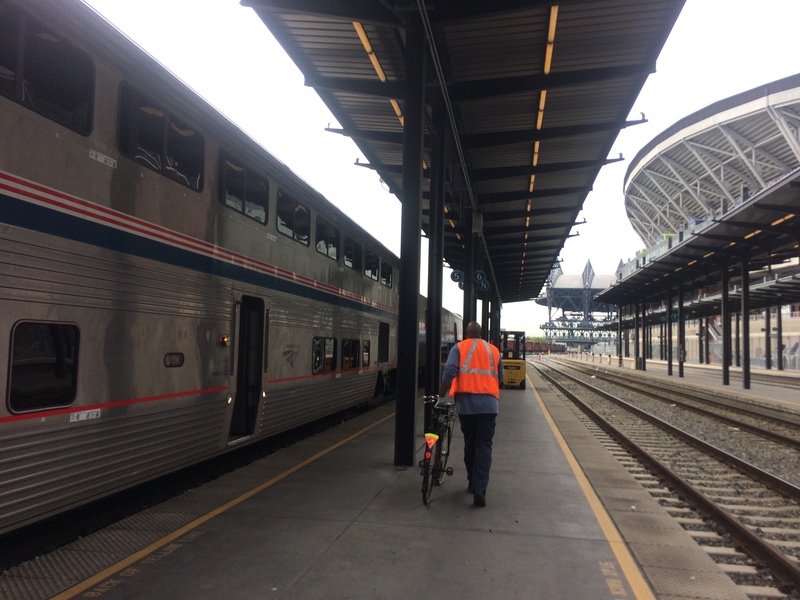 It was awesome, but as I’m not a big fan of driving places to ride my bike and am perfectly happy with all the places we can reach by pedaling or pedaling plus bike/train/ferry, I’m not sure how soon I’ll be back. Neighbor Kelly pointed out the trail alongside the highway, but it doesn’t go all the way through yet. One can still ride all the way there, but parts of it are along fast-moving highways and parts of it experience stop-and-go traffic with no shoulder for passing near Multnomah Falls. 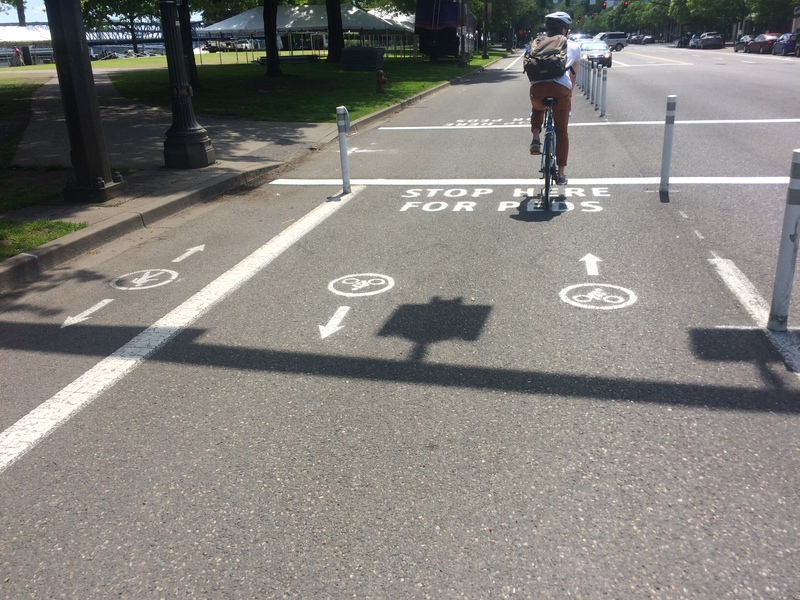 Better Naito is a temporary bike lane I took upon leaving the train station and it’s amazing! 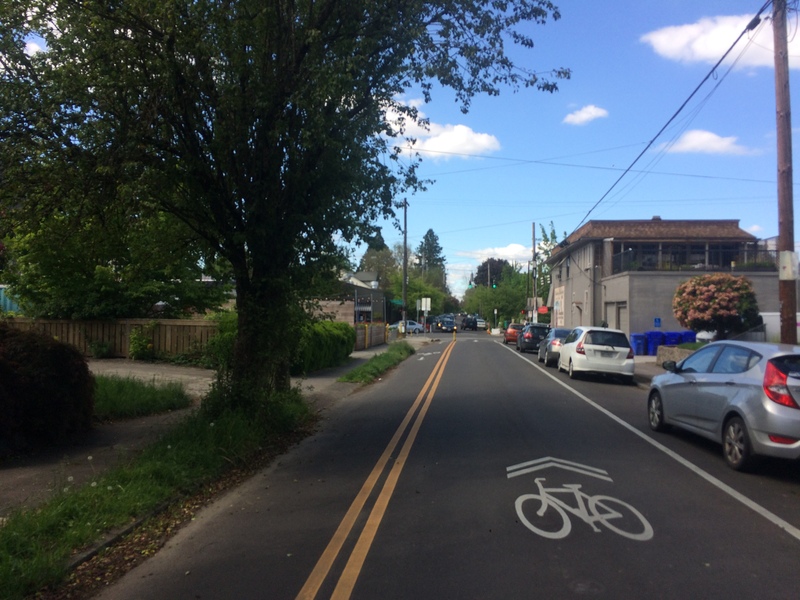 While accompanying Kath of Portlandize on her test ride for her weekend Kidical Mass PDX Treats Ride, we biked next to a contraflow bike lane on SE 34th Ave at Division. Kath said it was residents of that block who had spearheaded the project to fix the problem of people parking in front of their driveways. What an interesting and unexpected reason! 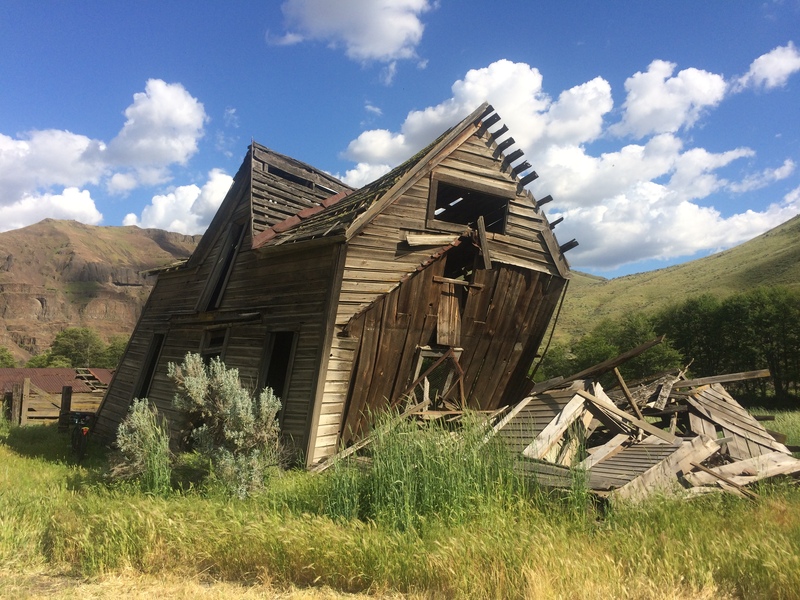 Have you been along the Deschutes River Trail? What was the old homestead like during your visit? Any additional tips? ← Happy Bike Everywhere Day! Looks like a cool ride, thanks for sharing!